What part of ‘You’re being ripped off’ do you not understand? According to Workers’ Comp Insider, the inpatient data released earlier this month by CMS, shows Medicare paid about $62 billion to cover more than 7 million discharges. …Philadelphia, Los Angeles and Newark, N.J., had the largest gulfs in charges between the top and bottom hospitals. 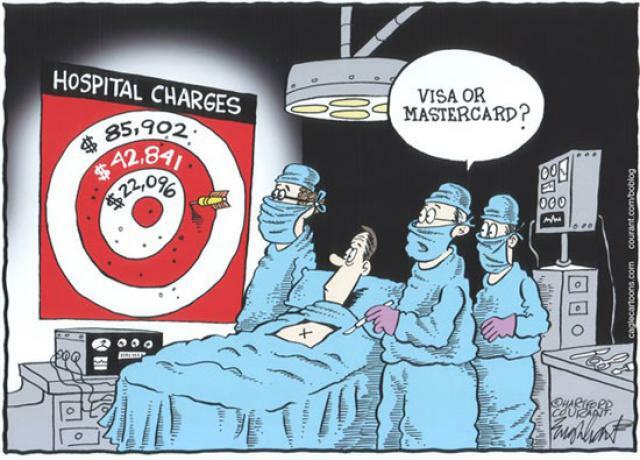 For example, in Philadelphia, the average difference in average hospital charges across all procedures was $123,847. In Los Angeles—an area rife with academic medical centers such as Cedars-Sinai Medical Center—the average difference between the highest-charging hospital and the lowest-charging hospital was about $112,000. Physician data encompasses 950,000 physicians, nurse practitioners and other providers and $90 billion of Medicare funds, according to Herman, and spending on hospitals and physician services makes up a majority of U.S. healthcare expenses. The Modern Healthcare article also listed the top ten Diagnostic Related Groups (DRG’s) by total payments to hospitals, and the number one DRG was DRG 470, Major Joint Replacement without major complications/comorbidities, with 446,148 discharges and $7 billion in payments. If you think that you can negotiate your way out of paying through the nose, if you think that opt-out is going to be the savior to your bottom-line that its promoters promise it to be, and if you think that getting better medical care is possible in your local hospital, then by all means, continue to delude yourself, because that is what you are doing. But if you see through all of the hype about opt-out, and see it for what it really is, an ideological tool that employers will wield against workers, and if you are tired of paying hospitals outrageous charges and paying for physicians to pad their bank accounts, then you need to consider an alternative to high-cost, average quality medical care, and consider medical travel. It will save you money, and provide your employees with a better outcome and a better outlook on the job. This entry was posted in Billing, Cost Control, Health Care Costs, Hospital Fees, Hospitals, MEDICAL COSTS, Medical Tourism, Medicare, Opt-out, Workers' Comp, Workers' Compensation and tagged Costs, Health Care Costs, Hospital Charges, Hospital Costs, Hospitals, Medical Costs, Medical Tourism, Medical Travel, Medicare, Workers' Comp, Workers' Compensation on June 8, 2015 by Transforming Workers' Comp.